String antiqued ivory-tone beads with natural hemp, leather or suede for cool safari jewelry. 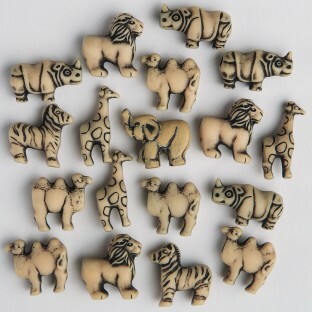 Includes 6 jungle animal designs: rhino, camel, elephant, lion, zebra and giraffe. 20mm with large 3.5mm holes. approx 125 beads per 1/2-lb bag. String antiqued ivory-tone beads with natural hemp, leather or suede for cool safari jewelry. Includes 6 jungle animal designs: rhino, camel, elephant, lion, zebra and giraffe. 20mm with large 3.5mm holes. Approx. 125 beads per 1/2-lb. bag. Made in the USA. We use these for recognition items with our employees to create a string of accomplishments.